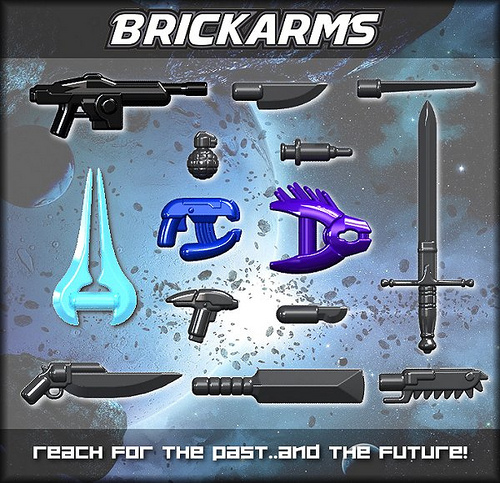 BrickArms has released new custom minifig weapons spanning from historical to sci-fi genres, including the Heavy Scifi Rifle, Plasma Blade, Needle Gun, Energy Pistol, Photon Pistol, Mk2 Frag Grenade, Gunblade, Chainblade, Scalpel, Syringe, Bayonet, Claymore Sword, Glaive, and Cricket Bat. This is all well and good – I like the Claymore in particular – but WHERE’S MY DANG RAY GUN?!!! *pant* *pant* *pant* OK, I’m calm now… But seriously, please release that wonderful ray gun. The BrickArms Retro Raygun is one of my absolute favorites as well, and given he’s very aware how much folks seem to love it, Will definitely plans to add it to the BrickArms line-up as soon as he’s able! Yay for the cricket bat! !